While many consider the 19th century as artists' breaking point with religious subjects, artists since have examined and re-appropriated the forms, motifs and iconography of religious art in depictions of everyday life. Easter, the ultimate religious season, often confronts individuals to reassess their spiritual inclinations. An artist’s grappling of art historical religious traditions proves similar to the layman’s interpretation of Lenten fasting. While many consider the 19th century as artists' breaking point with religious subjects, artists since have examined and re-appropriated the forms, motifs and iconography of religious art in depictions of everyday life. Iconoclast Manet, who nevertheless strove to present Christ’s true suffering with Realist grit in a canvas, maximized the potency of Christian martyrdom in his Execution of Emperor Maximilian for a contemporary, political subject. Quoting from Goya’s The Third of May 1808, a central Christ-like figure faces down firing squads with dignity. Rather than a intense mediation on lingering Catholic doctrine (or guilt), the artwork memorializes art history. Stephen Kaltenbach"Caput," Letterpress, Published by Bert Green Fine Art in partnership with Aardvark Letterpress. Click to inquire. 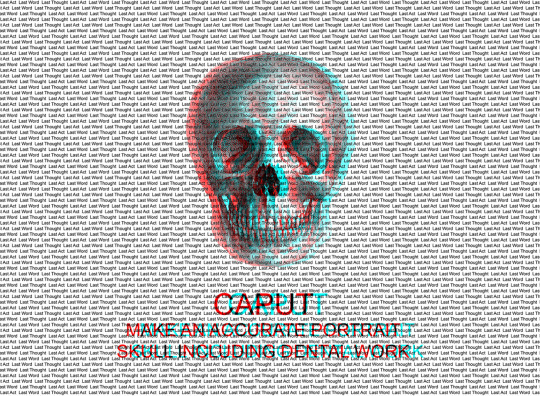 Stephen Kaltenbach isolates the skull in his work “Caput”. 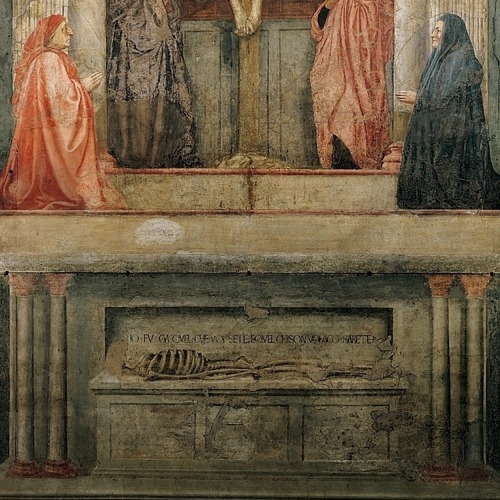 A companion to its subject is Florentine Masaccio’s Holy Trinity, a fresco uncovered in Santa Maria Novella. In its depiction of Christ’s crucifixion, a skull lays at the base of the cross in allusion to Adam; thus a symbol anticipating and concluding Christ's death. Like Caput, it is accompanied by a Latin inscription: What you are, I once was: what I am, you will be. Talk about punny! Kaltenbach’s use of the word-perhaps a play of “Kaputt”, also references itself in its Latin meaning for head. Seperated by centuries, Kaltenbach decodes the religious symbolism of the skull for humor. Wayman Elbrdige Adams, Mother and Child, Oil on board. Eckert & Ross Fine Art. Click to inquire. Wayman Elbrdige Adams’ Mother and Child, like many mother and child scenes, replicates Raphael’s pastoral Madonna and Child (The Small Cowper Madonna). Both artists utilize a pyramidal form to group the duos, a humanist expression of geometric divinity. Madonna and Christ, as the most iconic Mother-Son duo, creates a compositional precedent for gesturing maternal love. Eric Forstmann’s rectangular composition, plastered with secular trinkets, quotes the predella shape of altarpiece diptychs. 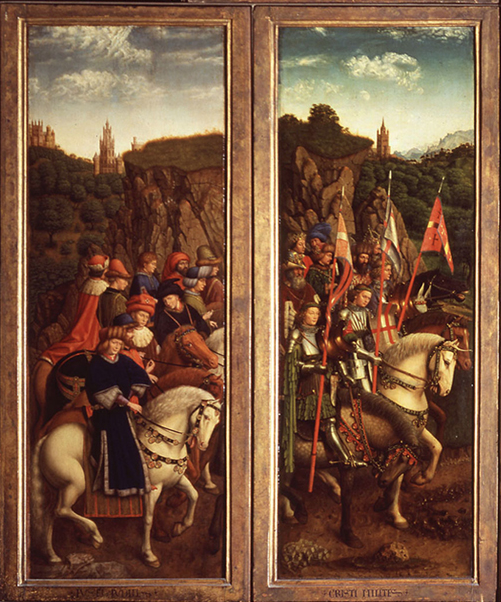 As a locus for narratives, Forstmann’s canvas and Renaissance altarpieces expound upon a story...viewers (as the devotional) engage as spectators of the scene. 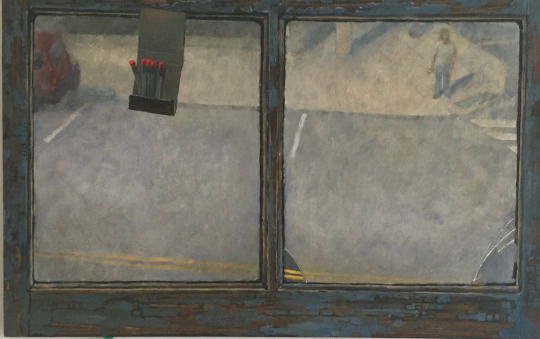 Eric Forstmann, Match, Oil on Board, Eckert Fine Art. Click to inquire. From Jan van Eyck’s Ghent Altarpiece, 1432, St. Bavo’s Cathedral. While contemporary artworks quoting Renaissance prototypes might not be a bold artistic statement, it reveals a kinship between works of art separated by centuries.